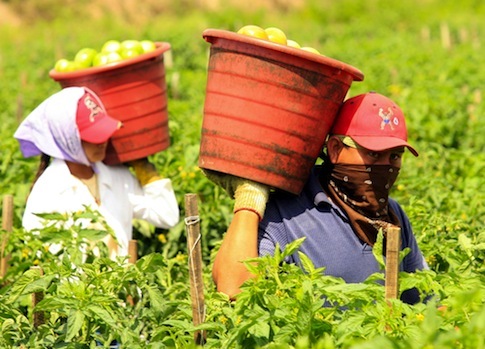 Four class action lawsuits filed by migrant labor advocates allege that a Florida worker center called the Coalition of Immokalee Farmworkers (CIW) and its corporate partners have failed to pay the workers they supposedly represented thousands of dollars. "Worker centers" have been described as the "future of unions" by labor outfits like the AFL-CIO. These organizations, which are often funded by labor unions, advocate for worker interests, negotiate pay and working conditions, and conduct public protests and pickets. However, because they are classified as nonprofit organizations instead of labor unions, they do not have to disclose their activities to workers or seek their approval when striking deals with employers, as federal regulations require unions to do. According to lawsuits filed by the Migrant Farmworker Justice Project (MFJP), that lack of transparency has resulted in farmworkers failing to collect payment owed. "We find it curious that the coalition isn’t as concerned about paying our clients as we are," MFJP managing director Gregory Schell said. "This goes against the mythology that this is a grassroots, worker-driven movement. The workers got nothing to do with this. The worker doesn’t see the deal, doesn’t vote on the deal." Schell’s lawsuits seek to recover tens of thousands of dollars that have not been paid out to workers who were supposed to benefit from the CIW’s signature achievement: the "penny-per-pound" program. CIW launched penny-per-pound in 2005 when it began to picket McDonald’s, calling on the restaurant to pay workers one extra cent per pound of tomatoes picked. The company agreed to the deal in April 2007, in exchange for labor peace. "The increase will be paid directly to farmworkers harvesting tomatoes purchased by McDonald’s," CIW said in a joint 2007 press release with the company. A bucket of tomatoes weighs 32 pounds, which provided workers an additional 32 cents per bucket in their paychecks. This represented a huge raise for pickers, who earned 45 cents per bucket when the McDonald’s agreement was signed, according to CIW’s research. The program collected more than $10 million between January 2011 and May 2013, according to CIW’s website. The publicity CIW received for the program has proved a fundraising boon: CIW has benefitted from substantial contributions from far left organizations, including the Kresge, Kellogg, and Ford foundations. The group received more than $3 million in grants and contributions in 2011, more than triple the $870,000 it collected in 2010, the year before the program went into effect. The penny-per-pound program fought for by CIW would be considered illegal under existing labor law were the worker center a union rather than a nonprofit, according to Ryan Williams, spokesman for Worker Center Watch. Federal law prohibits unions from engaging in secondary pickets, such as the act of protesting McDonald’s to increase wages at a supplier, as CIW did. "They picketed and protested to try to bully franchise owners into supporting this program," Williams said. "CIW is trying to intimidate these companies to provide bonuses to workers who don’t work for them—it’s systematically targeting the people CIW thinks have the biggest bank accounts." McDonald’s and 10 other major grocery and fast food chains, including Whole Foods, Trader Joe’s, Burger King, Taco Bell, and Subway, have signed up for the program, but the task of distributing the money fell upon their suppliers—most of which did not sign agreements with CIW until 2010. McDonald’s began putting money away in escrow after signing the 2007 agreement, while the CIW waged public campaigns against Florida suppliers. That money was only released to the pickers who were employed after 2011, according to the lawsuit, while those who worked the fields in the interim years received no money. "The money was paid only to those who were working in 2011 and 2012. The people we’re representing actually earned the money for performing the work between 2007 and 2010," Schell told the Washington Free Beacon. "We want the workers who worked those years to be found and pay them their money." The issue boils down to transparency, Schell said. Workers were not allowed to see or review the penny-per-pound deal and the coalition has fought to prevent the deals from being made public using "scorched earth tactics," according to Schell. The lack of accountability attracted the attention of labor watchdog Worker Center Watch, which sent a letter describing the allegations to Florida Attorney General Pam Bondi in November. An attorney general spokeswoman said the office is reviewing the letter. CIW denied the allegations detailed in the Worker Center Watch letter. "Attacks like this one are an unfortunate, but predictable, consequence of effective social change, and that is only more true when that change comes against long-established financial interests like those in the food industry," the coalition said in a statement. Schell, who has been a worker advocate for more than three decades, said he does not sympathize with the anti-union groups that have trumpeted his case. However, he said that such negative attention is hard to avoid when the CIW is "cloaked in secrecy." "I don’t think anybody woke up and said let’s screw the workers. There were oversights, which is typical when you go from being a movement to the more mundane job of administration," he said. "The coalition is going to have to explain why they don’t share the agreement with the workers. … Most would find that troublesome." The lawsuits are expected to return to court in 2014.